Enjoy The Olympic Winter Games Opening Ceremonies! One of the best sporting events of all time started today. The Olympic Winter Games are a wonderful event because we get to see the best athletes in the world competing in those exciting but obscure winter sports that generally do not receive much attention or media coverage. Except in Lake Placid, of course. Good luck to the 12 Adirondack Olympians! Let the Games begin! As promised, here's the word on current Adirondack ski conditions: not too bad. Actually, the cross-country skiing at Mount Van Hoevenberg is excellent. Despite the 2010 Adirondack Snow Drought, (they have their 2010 Mid-Atlantic Snowmageddon; we get a special name too.) the skiing throughout the Adirondacks is holding up fine. We've had a few inches of snow here and there over the past week and temperatures have remained very cold, allowing what snow we have to stick around. Of course, the clear, cold weather is a symptom of the reason the region is getting shut out of the big snow storms. However, one must always look on the bright side of life. And that is: skiing is great throughout the Adirondacks. I received a surprisingly positive report from the Adirondack backcountry this week. I understand the high country has even more snow than the lowlands and the skiing is very good. Whiteface is also in great shape with delightful skiing. Today is another beautiful clear, Adirondack blue day, with the promise of a very nice ski on the agenda. 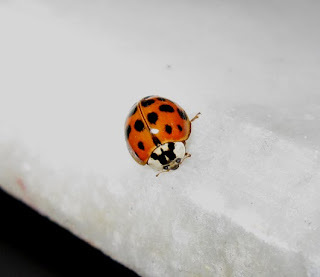 Today's featured photo is my ladybug friend.